View our large selection of hex Wobble Broach sizes. View our large selection of square Wobble Broach sizes. View our large selection of torxÂ® Wobble Broach sizes. Polygon Solutions offers a full line of internal Wobble Broach tools. We design, manufacture and distribute quality Wobble Broaches in house at our factory in Fort Myers, Florida so you can be confident that you are ordering factory direct. We have over 62 years of experience in the manufacturing industry and our Wobble Broaches are guaranteed to be accurate as our parts are precision ground with a target tolerance of +0/-.0005. Standard Wobble Broaches such as Hexagon, Square & Torx are always in stock and will be shipped same day. Our Wobble Broaches can be ordered from M-2, M-42, PM M-4 or PM T-15 High Speed Steel. Coating options are also available as well as custom cut lengths, tolerances, overall length, dish angle, corner radius and flat location. Custom form Wobble Broach tools can also be manufactured according to your exact specifications. Such special forms include Double Square, Double Hex, Double D, Involute, Spline, Serration, Spur Gear, Six Lobed or Star and Keyway Wobble Broaches. These Wobble Broach tools can be used on any horizontal or spindle machines such as cnc lathes, mills, etc, and can be used in such material as aluminum, brass, steel, titanium, plastic and many other materials. Our technical support department will assist you through the entire Wobble Broaching process if needed. From set up to finished product we will guide you along the way and answer any questions and address and problems that you may encounter. Wobble Broaches are widely used by the aerospace, medical, automotive, plumbing and fastener industries. Call us to see if Wobble Broaching is right for your project: 239-628-4800 or fax a print to us for a free quote: 239-628-4801. Polygon Solutions designs, manufactures and delivers precision Wobble Broach Tools and Wobble Broach Tool Holders throughout the World. 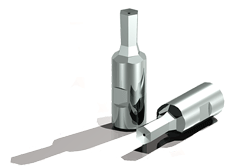 Same Day Shipping is available on all standard hexagon, square, and torx style wobble broach tools. Our Wobble Broach tools are made from hardened M-2 high speed steel but may also be ordered from PM M-4, M-42 and PM T-15 High Speed Steel. For tougher applications we offer TiN, TiAN and TiCN Coatings which will reduce the wear on the broaching tool. We are the only Wobble Broach Tool Company to offer a pressure relief vent hole that goes through the center of the broaching tool. Fluid escapes out of the side of the broaching tool holder. This Pressure Relief Vent Hole Technology allows air and fluid to escape instead of building up inside the workpiece pilot hole during the wobble broaching process, thereby adding longevity to the wobble broach as well as the machine being used. All of our wobble broaches include this vent hole at no additional charge. Standard Wobble Broach forms consist of internal Hexagon (Hex), Square and Torx type shapes. At Polygon Solutions we have the skills and technology to produce just about any custom shape wobble broach tool that is required to achieve your needs. The most common special shapes are Double Square, Double Hex, Double D, Serration, Spline, Involute, Rosan style, J500 and Keyways. If you need a custom shape produced please contact us at 239-628-4800 and we will further assist you. Although Wobble Broaching is not new, it is becoming increasing popular in the automotive, aerospace, medical and plumbing industries. This is due to the advancement in engineering and machining technologies. Wobble broaching is often referred to as rotary broaching. If you need more information regarding the wobble broaching process or how wobble broaching works our technical support staff we be more than happy to assist you with whatever questions or concerns you may have. Tags: Wobble Broach, Wobble Broach Tools, Wobble Broaches, Wobble Broaching, Wobble Broaching on CNC Lathe, Hex Wobble Broach, Square Wobble Broach, Torx Wobble Broach, Special Form Wobble Broach, wobble broach holder.